Manufactured from a far superior aluminium than most high performance pistons, it contains a much higher silicon content. 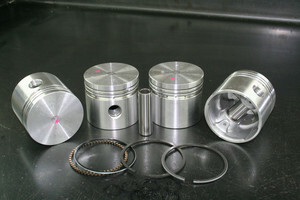 Using advanced heat treatments, a more heat-stable piston is created. To use with later press fit type con rods just discard the circlips. Alternatively hone out the small end of the press-fit con rods (0.0008" clearance) for fully floating pins.